I know that the online craft store has been developing very slowly. I am trying to coordinate the web site projects and blog project photos with some of the items for sale in the online store. Hopefully, by next week we will have some gemstone bead strands for sale. 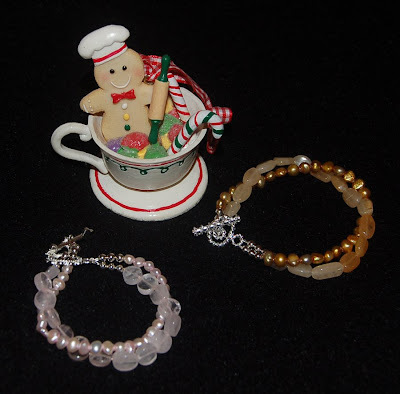 Pictured here are three bracelets made with the beads. Each one can easily be crafted with just half a strand of beads plus some pearls and/or chain and some sterling silver findings. At three 16" strands for $20 I think it is a real bargain because the beads are REAL gemstones. I will write up the instructions for the bracelet with the heart chain and locket as a project for the first online newsletter. I am especially pleased with the wrapping on some of the gifts. (See photo.) The purple wrapping is a furoshiki cloth whose corners were knotted diagonally and then knotted several more time to form little balls. 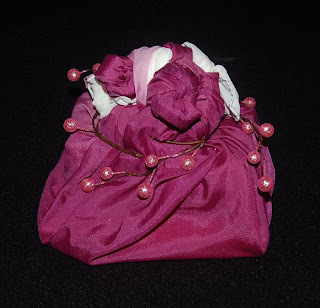 The ends of the cloth were then tucked under the knots and a branch cut from a large pink glittered ball decoration (from BFC) was wrapped around the knots. The cloth did not come from BFC but you can easily find a large scarf and use the same wrapping technique. 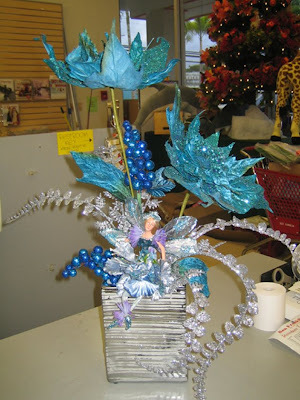 The third photo shows how easily you can turn plain wrapping into fancy with the addition of a glittery floral pick or sprigs of glittered foliage. As I hurry to finish making gifts and wrapping them up, I remember my husband's yearly Christmas warning.....keep it simple! This year I am actually heeding his advice. There are a few ladies on my gift list who wear simple jewelry so I have to ignore my own jewelry preference (gaudy) when I design for them. The two jewelry pieces in the photos are not only simple in style; they are super simple to make. Get out your jewelry tools and make a bunch of these in just a few hours and stay within your budget too! Last Christmas my sister gifted me with a large container of mostly clear, vintage, glass buttons. For a year I thought about and played with the buttons trying to come up with a good use for them. I finally got an inspiration this week. I decided to make a button bracelet for my sister. (I know she doesn't read this blog or even use a computer, so I can reveal her Christmas gift.) I think the finished bracelet has the look of an icy winter's day because the buttons look like snowflakes. I will write up this project and post it on our web site (http://www.bfcraftclub.com/) as soon as possible. 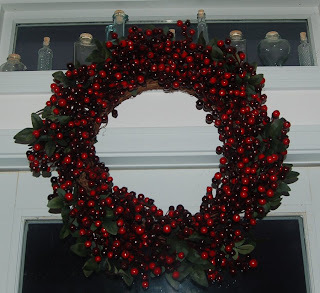 Selling now at BF Crafts is a realistic looking berry wreath from Sierra Pacific. I like that the berries range in color from red to blackish red. (See the photo.) With very little effort the wreath adds a rustic charm to our home. Also, I plan to snip off a few sprigs from the wreath and use them to decorate gift packages and Hearty clay cupcake ornaments. I think I should add a big bow to the wreath. I am very fond of the rolls of extra wide ribbon which is meant to be wrapped around a Christmas tree. I use them with plain or textured foil wrapping paper to make a spectacular presentation. 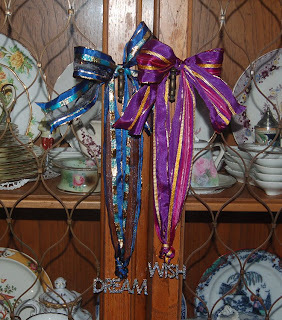 This year I paired the gauzy, sparkly ribbon with the bling-bling Swarovski crystal word ornaments. I took off the dinky ribbon that came with the ornament and replaced it with a generous length of ribbon. (See photo.) I think I will also attach a large jingle bell at the bottom of the ornament to add jingle, jingle to the bling, bling! Here is a picture of the stocking I just finished for my son. I always felt guilty that his stocking was made in a rush long ago and I never made a better one after all these years. 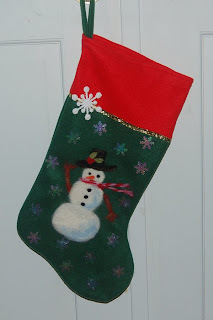 This year I found an inexpensive felt stocking at BF Crafts and decorated it with wool roving using the felting technique and Clover tools. I'm rather proud of the way the stocking turned out and my son liked it too! I lightly sketched the snowman with a white color pencil and then just started felting with the needle tool. To add some sparkle I glued on sequins and a large snowflake. Later I plan to embroider my son's name on the cuff of the stocking. Thanks for the comment, Betsy G. I don't know the answer to your question about the Swarovski crystal tree pendant because I did not design the project. I think I saw the crystal tree at the Bead Shoppe in Ben Franklin Crafts so perhaps you can visit the store or call to ask someone about the project. I think there might even a free project sheet for the crystal tree. Good luck and thanks for reminding me that I wanted to pick up the parts to make the crystal tree earrings. Hurray! This is to announce two openings. For those of you who live in Honolulu and perhaps work downtown, we have now opened a bead shop called 'Craft in the City'. The new store is located at 1040 Bishop Street. It is a small shop mostly devoted to paper and bead crafts. Although Craft in the City has not officially had a grand opening, it is open for business while our staff becomes aquainted with the downtown customers' crafting interests. We are hoping that this new store will add some excitement to the downtown shopping scene and be a pleasant spot to learn a new craft or pick up bead and paper supplies conveniently. The other new opening is our online craft store. Please visit our website, http://www.bfcraftclub.com/ , to see the unique items we have for sale. There are lots more items, which have yet to be put on the site, so visit often to see what's new. I hope that all of you are working on your feast preparations. If you're not hosting the party, maybe you'll have time to craft some cupcake ornaments during the football game. (See the photograph for variations of the cupcake in the newsletter. Click on the photo to enlarge it.) The cupcake ornament (instructions in the last newsletter) is basically made from Hearty clay, which is decorated with plastic candy and beads. 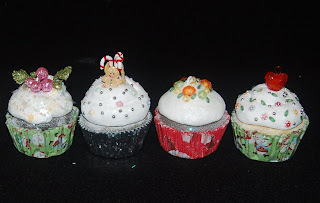 and then set in cupcake baking cups that have been stiffened with decoupage medium. Don't forget that this Friday is the day to use the 40%off early bird (7am-9am) and 40% off late bird (7pm-9pm) coupons. While you're using your coupon, be sure to start doing some Christmas shopping and get your crafting supplies for making festive decorations. The holiday season is a wonderful time to craft together as a family. Crafting not only makes memories, it is also a great stress reliever. 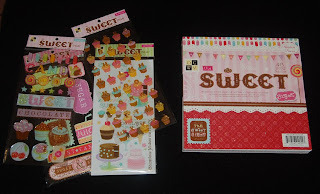 At first I was reluctant to buy the 12x12 Sweet Stack because I had already purchased two of the smaller sets. However, when the 12x12 size went on sale I couldn't help myself. I was elated when I opened the stack because the assortment of papers were somewhat different from the smaller stacks. The larger sheets seem to be designed more for scrapbook pages and the smaller sheets work well for card making. Also the larger sheets allowed me to make a cute gift container for the note cards I made earlier. (See photo.) Begin by tracing an open Ori Yoki cup (the plastic container that is flat, printed plastic that snaps into a cup shape) onto a sheet of 12x12 from the Sweet Stack. Then cut it out, score fold lines, and assemble the cup with double stick tape. Add on a ribbon and a die-cut from the Sweet Stack collection and voila you have a pretty cup to hold your handmade note cards. Wrap the whole thing in a plain cello bag with a decorative bow and you have a super gift for that special person on your list. While buying the DCWV paper stack, I decided to invest in a Fiskar squeeze paper puncher. Although this paper punch has been in BenFranklin Crafts for awhile, I put off trying it and reasoned that I really didn't need another paper punch. How good could this new tool be anyway? Boy, am I happy that I tried this scissor-like punch. It is easy to squeeze, light-weight, less bulky than other punches, and enables you to see where you are punching so you can center designs. I love this new punch! I am definitely getting more squeeze punches! Bits and Pieces packages of beads, sequins, pearls, and other embellish-ments are on sale this week until Friday. I just discovered that the contents of each package fit perfectly in the Making Memories 6 pack small plastic container jars with screw on covers. 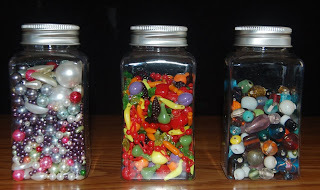 Filling the jars with the Bits and Pieces items and keeping them out where I can see them, stirs my creativity. 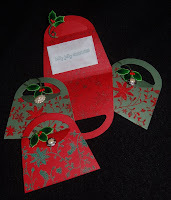 Especially during the holiday season, keeping embellishments within easy reach makes decorating crafts more enjoyable. Also on sale this week are DCWV 12x12 paper stacks. The newest design of paper stacks is Sweet Stacks, which I absolutely adore. I was so in love with this glittered, candy, cupcake, chocolate, themed light-weight cardstock that I started making cards the very next day. 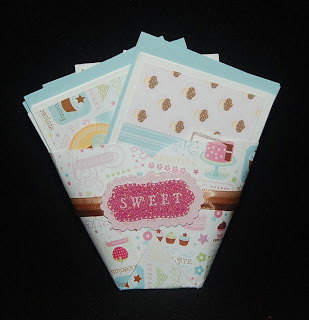 The Sweet Stacks come in three sizes and have matching stickers, rub-ons, and chipboard die-cuts. 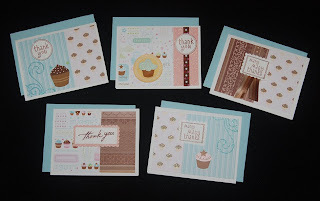 The embellishments make it so easy to make sets of cards that would be perfect co-worker, teacher, or coach gifts. I think thank you note card sets are the mo st needed type at this time of year and they serve the double purpose of thanking that special person in your life. I used the Hero Arts Clear Stamp thank you stamps on the card set in the photo. By stamping a whole sheet of card stock and embossing it, I saved time and have lots of 'thank yous' for future projects. If you want a little more glitter on your cards you can dab on Stickles or use Glitter Stack paper in colors that coordinate with the Sweet Stack mat papers. Matching colored envelopes with your cards will make your sets more professional. If you are a craft club member, you probably already know that the last newsletter is the last one you will receive in the mail. In an effort to become a greener company, we have decided to post future newsletters on our craft club site. This change will allow us to publish more often, keep product information current, and offer you more coupon members only discounts due to the elimination of printing and mailing costs. Economic change changes the way we need to operate our business but rest assured that it will not affect the way we service your crafting needs. It is always our business to please customers and that will never change. With Thanksgiving only a dozen days away, I hope that your plans are set for the big feast day. If you haven't sent out invitations yet, I will post a simple invitation you can make and get in the mail. I also made an autumn place mat project (see photo) from a cotton dish towel. In the photograph you can see a tranferware plate and some Victorian and vintage utensils. I am a long time collector of old stuff, especially items that can be used at mealtime. 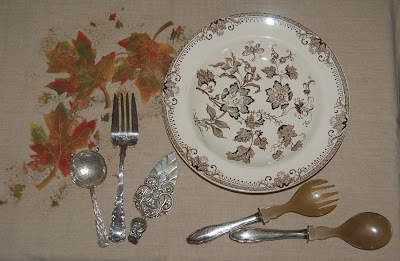 Brown transferware dishes from the late 1800's or early 1900's seem to be just right for Thanksgiving dinner and it is very attractive to have a table set with varying patterns. The little ornate pie server is a recent find from a San Francisco antique shop. I don't know much about it except that it is sterling silver and I can't wait to use it to serve pumpkin pie. I don't remember where I bought the large serving fork, but I was pleased to see an article in this year's Martha Stewart Living Thanksgiving issue about this type of bright cut silverware. While polishing the fork I noticed that it had a small repair which is probably why it cost less that I thought it should. I usually spend under $20 for my serving pieces unless it is really calling my name. The tea strainer was an addition to my collection of tea time implements. The bamboo decoration on the strainer made it seem Asian even though it is most likely from Europe. Perhaps it was from that time period (Aesthetic?) when everything Asian was admired in Europe. The silver salad servers seem to be half horn and the simple style makes me think it is from the 1930's but I'm not sure. I suppose it is the mystery of the past life of my antique/vintage things that keep me collecting and wondering. I know that this blog is mostly about collecting but I think that many crafters are cooks and collectors. Maybe it is a genetic thing or we're just chubby pack rats! If you've been to the Ben Franklin Crafts' Bead Shoppe recently, you've probably noticed the bunches of elastic bead bracelets on sale for 2/$7. While they are wearable and rather nice for the price, I don't like elastic bracelets because inevitably the elastic will break. I was drawn to the basket of sale bracelets because the beads used in them were of good quality. The beads made of shells, pearls, semi-precious gemstones, and glass would definitely be more expensive if you bought them by the strand. I purchased lots of the shell bracelets and decided to try creating some jewelry using th e long two holed shell bead. The photo (click on it to see details) shows the results of combining the long, rectangular iridescent bead with pearls, gemstones, and a few crystals. When I have some free time I will post the instructions for the necklace on the bfcraftclub website. I also bought an elastic bracelet that was made with square, pink, two-holed, shell beads. I'm thinking of combining the pink shells with some pearls and rose quartz to make a more stylish bracelet. I forgot to mention that on Sunday I also purchased a package of 12x12 paper and punch-outs called 'Chocolate" by S.E.I. 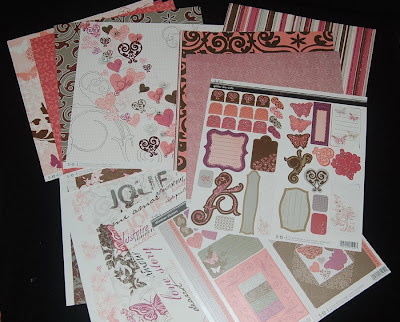 I love the paper designs and color scheme of pink, grey, and brown shown on the outside of the package. However, a wonderful surprise is inside the package because the paper is extremely beautiful and elegant. There are two-sided foiled, textured, and glittered paper with swirls, words and butterflies galore. Even the stickers and punch-outs are gorgeous! The content list on the package does not make it clear that there are 28 sheets of either paper or cardstock, which means the paper is a bargain when compared to purchasing single sheets. Maybe you can share a pack with a friend because there are two of almost every 12x12 sheet. This paper pack would make an excellent Christmas gift but you really should buy one for yourself...I did! While looking through the photographs I took at Ben Franklin Crafts on Sunday, I saw something I didn't notice before. I snapped a picture of what I thought was a pretty scene of the miniature village. 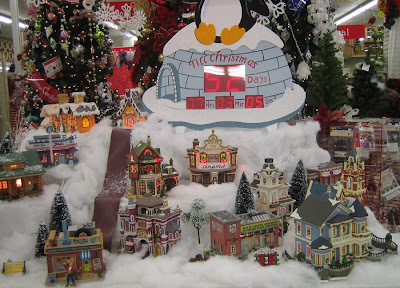 I didn't realize that the igloo above the village (sorry I cut off the penguin's head) had a digital light up that counts down the days until Christmas. I wonder if the lights can be purchased? A parent with a young child might be relieved to not have to answer the how-many-days question and just refer the child to the igloo. Two hours of shopping at Ben Franklin Crafts this past Sunday filled me with fresh ideas and exciting supplies. I even did some Christmas shopping. I bought a three-way jewelry tool that is a tweezer, needle-nose plier, and wire cutter, which makes it a perfect gift for friend who is learning to make jewelry. For someone who writes and sends lots of cards I found the perfect sets of four pretty notecards with matching die cuts from Tapestry. I plan to include with these sets some glitter, crystals, brads and other embellishments. I know even my non-crafting friends will have fun decorating the cards and be proud to mail the finished cards to their friends. While at the Hilo store, I saw Donna putting the finishing touches on a beautiful original bouquet. She used a fairy ornament and some matching glittered floral components. I was really impressed with the artistic arrangement and creative use of unlikely elements. See this blog's photo. The other photo is of a book I purchased because the jewelry in it is so retro and wonderfully wacky. I knew just from the cover and title that I would love the book and I do! (Notice the Post-It tabs I use to mark projects I'm thinking of trying.) The unique ideas and information about all sorts of things makes this book good reading for any cr after. Oh, while I was at Ben Franklin Crafts I found a strand of white button pearls that would have perfectly matched the replacement earring (mentioned in the last blog). Too bad I already mailed the earrings. I calculated that the strand of 85 pearls would make 14 pairs of three pearl earrings. Together with the cost of the ear wires the total cost of the earrings would be about $3.15. This is why these earrings would make great gifts or craft items. The button pearls would also look good in a necklace with faceted rondel gemstones or crystals. A girlfriend asked me to make her a replacement for a lost pearl earring. This was no problem because I would surely be able to match the pearls. Even though I have lots of pearls, it wasn't that easy to find three pearls matching the size, shape, and color of the original earring, so I ended up making a new pair of earrings. 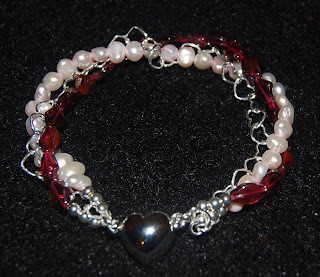 The design simply involved using sterling wire to make loops on both ends of two of the pearls and using a sterling head pin on the bottom pearl and making a loop on top to connect it to the other two pearls. All three pearls were then attached to the pierced earring wire. While looking for the white pearls, I found other pearls that I thought would also make pretty earrings. Making these earrings was so easy that I am sure that anyone could do it. Handmade earrings make great gifts and craft fair items. I think that inviting friends over for an earring making tea party might be a wonderful holiday gift for several girlfriends. 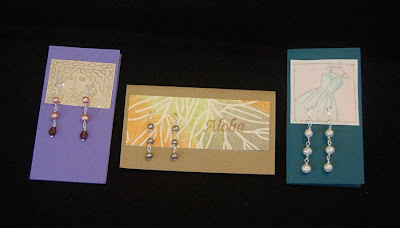 Oh, I put the earrings on mini cards made from leftover scrap paper and cardstock because I think that it is an attractive way to give a gift and it also makes a good presentation if you plan to sell your earrings. You can also write information about the earrings (beads, metal, etc.) inside the card and/or sign your name as the artist. After reviewing yesterday's post I realized that the photo didn't show the bracelets very clearly, so I'm posting a new photo. (Click on the photo to enlarge it.) The wooden block in the photo is an old wooden mold (for food) from Japan. The carvings in the mold are done by hand and I'm trying to think of a way to incorporate the designs in my jewelry. Oh, if you don't know how to do herringbone wire wrapping, you can Google up lots of instructions to learn the technique. The bracelet with more beads was made by stringing beads on copper beading wire and using crimp beads to fasten off the wire ends. One trick I learned is to string the beads on the wire without cutting it off the spool. This allows you to put one end of the clasp on the wire after you are certain of the bracelet length; then you can cut the wire off the spool and attach the other clasp end. I think this method wastes the least amount of beading wire. Anyway, the beads used are amber (five different colors), sunstone (the small salmon-colored rondelles), peridot (green oval), tigereye (large square from a package of Dress It Up beads), and copper spacers (balls and daisies from Sierra Pacific, available at BFC). Both bracelets have Sierra Pacific clasps. My favorite beads are the amber and sunstone, because they have an inner warm glow that only natural gemstones can impart. If you cannot find amber or sunstone, you could easily substitute jasper or agate. Splitting and swapping bead strands with fellow beaders is a good way to economize and yet have a variety of finished pieces. Sticking to one color palette (everyone get an autumn colored strand) but varying shapes and sizes of beads is one way your group can work together. A bead swap or jewelry swap could be just the thing to help you stay within a budget. 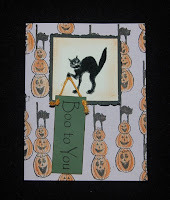 I'm still playing with the Studio G $1 Halloween rubber stamps as you can see from the photos. The cupcake rubber stamp image is the only non-Studio G one. It is from the Hero Arts cupcake border clear stamps. I applied glue (Martha Stewart glue pen) on the cat and dusted it with black flock (Stampendous). Martha Stewart glitter was glued on the cupcake. Using a paper towel, I smudged tea d ye Distress ink around the cat and on the edges of the Boo banner. You still have a few days left to make scary or funny Halloween cards and it's not too late to get some of those Studio G bargain rubber stamps. Quite often school photos arrive just before Halloween. 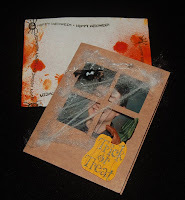 I think that it is cute to mail them out in Halloween cards that can also be photo holders/frames (later they can be included on a scrapbook page). I like the idea of being able to see part of the photo before the card is opened, so I designed my card to look like a window. Each window pane is a 1-3/4" square. The openings were cut with a craft knife and backed with acetate. The fake spider webbing ( a Halloween product sort of like polyester fiberfill) is my favorite part. Th e spider (the web was cut off the stamp design), words, and bat photo corners are the Studio G ($1 bargain) stamp designs. You can use glue ink (Tsukineko) and apply black flock (Stampendous) to the spider and bats or stamp the design and then fill it in with a glue pen (Martha Stewart) before dusting on the flock. The pumpkin was hand cut and the paper twist stem and leaf were glued on. 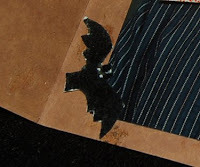 I had an old envelope that was tired looking and spotted with foxing, which seemed to be perfect for a Halloween card. To make the envelope more decorative and ghoulish I stamped on the Hero Arts border stamp and sprayed and dripped Andirondac terra cotta dye over it. You can spray on any blood colored ink or thinned paint to get the same effect. Have a Happy Halloween! When I learned that the caps of plastic bottles had to be removed and were not recycled, I was surprised and determined to find some crafty use for them. Of course you can always use little bottle caps to hold small amounts of glue or paint when working on a project. However, I wanted to use the caps for something that wouldn't be thrown away. I started with an orange cap from a Gatorade drink bottle. The color reminded me of a pumpkin. 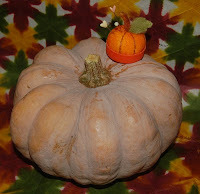 I wondered, "What tiny pumpkin project could I do?" Because I keep a small pincushion (vintage glass with a bird) on my craft table and find it to be useful to hold a few pins and needles, I started to envision the cap as the bottom of a small pumpkin pincushion. I think the project turned out very well and so I will post the instructions for this inexpensive recycling project on the bfcraftclub website. Pumpkin pincushions would be good party favors or teacher/coach gifts. Green or red caps could be fashioned into apples. The photo shows the pumpkin pincushion and a lovely real pumpkin from Laura-the-gardener. Don't you love the color of the real pumpkin? I think I'll make a bracelet with that dusty salmon hue and other autumnal colors. Isn't fall a great season of anticipation? I hope that you remembered that today was the day to use your 40% off one item coupon (in our newspaper ad). If you forgot, you still have tomorrow to use it. I knew exactly what I wanted to buy with the coupon...the Crop-A-Dile with the 6" reach! Although I have several eyelet punchers and setters, I'm hoping that this one will allow me to go through chipboard even in the center of an album cover. I'll be testing it out soon. I found more $1 bargains at Ben Franklin Crafts. From the Royal Brush Co. I bought two Clear Choice Stamp sets (Paris and Viva France). Maybe these will encourage me to do a scrapbook on our European trip, which we took years ago. I also scooped up some $1 ribbons. The velvet rickrack ones will add texture to my autumn cards and for Valentine cards I'm going to use the grosgrain printed with hearts. Pictured here (Click to enlarge.) 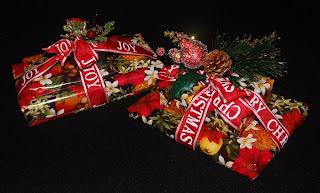 are two decorated pillow boxes (Sizzix die cuts). I ran blue paper through the die cutter and then stamped it with a snowflake backgrond stamp (Hero Arts) and embossed the silver (Martha Stewart) ink design with silver glitter embossing powder (Stampendous). You can just stamp with the ink but embossing powder makes it sparkle. 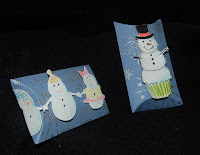 The snowpeople holding hands are a Sizzix die cut decorated with watercolor pencils. The single snowman cupcake is a Hero Arts rubber stamp design, colored with watercolor pencils, and decorated with crystal glitter (Martha Stewart). The boxes were folded and then glued with Fabri-Tac glue (because it sets up quickly) and the snowpeople were attached with pop-up glue dots (to add more dimension). Make dozens of these boxes now and you'll be ready to wrap up those handmade jewelry gifts or enclose the always welcomed monetary gift. With everyone worried about the downturn in the stock market, it was good to see our loyal customers were shopping as usual on Sunday. Remember I said that I would return to Ben Franklin Crafts to purchase another Hello Kitty die cutter. My choice was Hello Kitty's little rabbit friend. She is so sweet and I know I'll use her on Easter projects this spring. I also bought a pillow box die cutter, which I think will make it easy for me to make lots of boxes for gift cards and handmade jewelry. The pillow box shape is easy to decorate and assemble. I was happy that I found several bargain items while shopping. 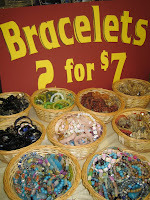 In the Bead Shoppe I found stretch bracelets at two for $7 (going on sale soon for $10 for 4). There were lots of choices, mostly gemstone and shell bracelets. I plan to take them apart and restring them because the beads are very attractive but the stretch elastic construction looks cheap. I am really excited about the long shell slices with two holes. 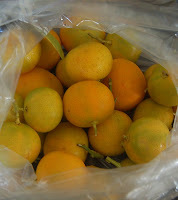 I am planning to use them in a wire wrap necklace project. The white and blue disc pearl bracelets were also a good buy because the pearls had two holes, which gives them an extra design element. The other super bargains at Ben Franklin Crafts were one dollar (yes, $1!) wooden handle rubber stamps and clear stamp sets from Studio G. The holiday themed clear stamp sets contained mini designs and some had words. I thought the graphics of the wooden handled stamps were great and I purchased lots of Halloween designs. I was told that the stamps are selling quickly. 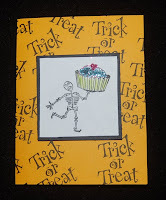 I plan to use the Halloween stamps on treat bags. I think the Thanksgiving mini stamps would look good on a dinner invitation. The words and small Christmas designs are perfect for tags. I'm sure the inexpensive rubber stamps would make terrific party favors. 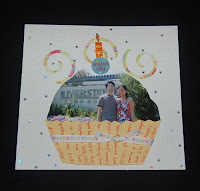 The card blank used was from the Designer Notecard (box of 70 cards) by Nicole Crafts. I cut the flowers and dress from DCWV Glitter cardstock. Just put a small piece of glitter cardstock over the part of that you want the die to cut so you don't waste. I found the dots on the dress hard to cut so I glued on Martha Stewart brownstone glitter instead. I recommend glittering the dress separately before attaching it to the card because the glitter will go into the spaces between the pieces. The little purse is a Mrs. Grossman sticker with rub-on words from Deja Views. The rhinestones were from a multi-colored, multi-sized K. and Co. package. The larger die cut pieces were run through a Xyron machine to apply an adhesive and the smaller pieces were just glued on. The eyes and nose were filled in by gluing small pieces of paper on the back. Oh yes, I cut off the antennae and wings even though I like the ladybug. Many of the Hello Kitty die cutters can be altered in a similar fashion. I don't think I can resist getting more Hello Kitty themed die cutters. I'm going shopping for a longer time tomorrow.....see you there! Shopping, cooking, crafting.....the good life! On Friday night I did some real credit card damage at Ben Franklin Crafts. Although I saw the beginning of Christmas displays, I didn't buy any ho-ho-ho or jingle items yet. I started in the Bead Shoppe and stayed there for quite a while. There were Imagine It beads on 30% off and special promotional gemstone strands at 50% off. I found some new flat oval Imagine It 7" strands, which I thought were already reasonable but with the sale plus craft club discount they were almost free! I'm excited to work with this new bead shape and will show you later what I do with it. I also purchased some great magazines-books. I'm not sure what to call them because they are in a small book format but have ads in them and are published monthly. These publications are by Northridge Media and include issues on beads, cards, holiday, paper, scrapbooking, etc. I like the fact that they have just a few ads and lots of projects. 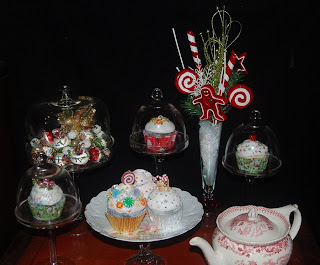 Because of the Christmas displays, I started thinking about what type of goodies I would be making for gifts this year. Usually I bake cookies and start testing recipes about this time of year. I saw a recipe for chocolate almond toffee candy on Martha Stewart Living and it seemed simple. I made some today and my family gave it a thumbs up. Next, I'll have to think about how I can package and ship the candy without it melting. To me, half of the gift is in the wrapping, so I look for unique wrapping supplies all year long. Odd color combinations like lavender, silver, and blue can be refreshing Christmas colors. Okay, my camera is back in action. 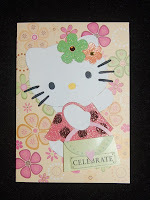 (See the photo of the thank you card using the small flower punch.) 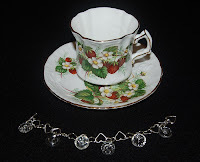 I recently completed the Bejing Olympic Necklace pictured with this blog entry. Overall, I'm pleased with the results especially because I was able to combine a majong tile and vintage kimono fabric in one project. I love the textures and colors on the necklace because I feel they add an interesting Asian look. To make the fabric covered bead simply cut a swatch of fabric 1"x 3"and glue it on to a 25mm wooden bead using Fabri-tac glue. Then string the bead on a wire and glue the bead caps down using the wire to position the caps over the bead holes. Once the glue is dry, remove the wire. It's best to use a slightly stretchy fabric and cut tiny darts in the fabric around the bead holes so that there will be a minimal amount of wrinkles. We will try to offer majong tiles with double holes and vintage Asian fabric on our website for those of you who want to try to make this necklace. The instructions for this project will appear shortly on the website. Right now I am trying to create a piece of jewelry to honor the Beijing Olympic games. Are you fixated on the Olympic games too? So far I think I will use some vintage Asian fabric to make some beads and incorperate them with some metal rings into a necklace design. If anything interesting results from my experimentation, I'll post a photo (after my camera returns). For about one week there will be no photographs with my blog posts because my camera is on a trip. I hope that you will continue to read, learn, and enjoy my blog minus the pictures. I will post appropriate photos later. A few days ago we celebrated our _ _ th wedding anniversary. (I'm not telling you the number of years we've been married because you'll either think I'm really old or that I got married at ten years old.) Anyway, we agreed to just exchange cards because we had already spent way too much on our last vacation during which we purchased gifts to ourselves. For most occasions I prefer to make a scrapbook page instead of a card because it involves about the same amount of work but gets saved in an album or framed for display. This year we took a fairly decent picture at Fisherman's Wharf in San Francisco so I decided to use it for the anniversary page. When I think Fisherman's Wharf, I think crabs (the eating kind). It wasn't difficult to find lots of crab/seashore embellishments. One large Jolee's sticker of a crab really appealed to me. Despite the somewhat high price for one sticker, I knew the crab would make the page outstanding, so I bought it. To add humor to the page, I postioned two sticker wine glasses in the crab's claw and wrote a funny caption. Of course I labelled the event with a date and place. It was such a simple page, but I thought it really captured the mood of our anniversary. The page will stay on display in a wrought iron easel (from Ben Franklin Crafts) for a while and later be put into a scrapbook. Some of you may know that I have a penchant for vintage and antique 'stuff', basically anything with patina on it. (Yes dear, that's why I find you attractive.) Anyway, sometimes when I'm lucky I dis cover (at a garage sale, flea market, or online) old jewelry that have the potential of being turned into uniquely, beautiful wearable art pieces. Even my husband sometimes searches on Ebay for items he thinks I might like. Recently, he purchased the cameo bar pin (for under $15 including postage) I used in the pictured necklace (click on photo to enlarge). Even though the pin is probably brass, I felt it deserved gold filled findings because it is such a charming representation of an era (late Victorian or Edwardian/Deco) when even costume jewelry was well designed. To ensure that the pin would not poke the wearer, I bent the C-clasp to lock in the pointed shaft end. I did not remove the pin back because I thought that perhaps someday someone will want to turn the necklace back into a pin. By doing simple wire wrapping (24 gauge gold filled wire) on semi-precious beads (garnets, pearls, and rose quartz) I formed the beaded chain and dangles. I think the resulting jewelry piece is one that I will wear with pride because I was able to recycle and create. As I mentioned previously, I was playing with my new Dreamweaver 'Arigato' stencil when I realized that I could stamp Clear Design stamps right over the kimono to add a print. Normally, rubber stamps don't register clearly because of the thickness of the stencil, but the Clear Design stamps are soft enough to press into the stencil openings. I use a stencil brush to pounce Versa Magic ink into the stencil design before stamping. Use a light touch so that the ink doesn't bleed under the stencil. (Pigment ink is thicker than dye based so it works better). Most crafters stencil on paper with chalk but that requires an additional step of spraying a fixative. I posted the progression of this card so you could see the (left to right) changes I made as I searched for a color scheme I liked. I thought the third one had the best Asian look which complimented both the stencil design and Clear Design stamps (Asian border). A pop dot under the fan adds dimension and you could also impress the stencil design for more depth. Oh, the suitcase mini scrapbook instructions are done and should be posted tomorrow. "Arigato"(thank you) for reading this blog. (see blog photo) in the next newsletter, but it doesn't have an English title so I didn't know what to call it. 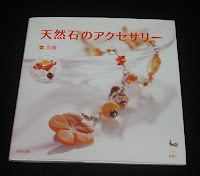 It is such a good jewelry book despite being all in Japanese that I decided to photograph the cover so you could find it at Ben Franklin Crafts. (The books from Japan come in bulk so you'll have to hunt for this one.) I found this book appealing because of the very feminine look of the jewelry and the unique color palette used by the Japanese designers. Many of the beaded projects include pearls and all of the projects have ample illustrations (with cm measurements) so an intermediate level beader should have no problem creating similar pieces. 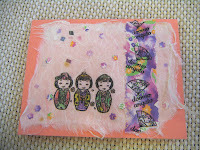 Today I decided to 'play' with my new Hero Arts Clear Design sets (with Asian designs) and a Dreamweaver stencil (Japanesse girl with 'Arigato' word). I wanted to see if the Clear Design rubber stamps would be able to stamp through the stencil. Most rubber stamps with wood handles have rubber that is too hard to print clearly through the stencil. Because the Clear Design stamps are soft and flexible they worked well with the thin Dreamweaver stencil. I didn't like the color choices I made on my first attempt with this technique, but I will work more tomorrow and show you the results in my next blog post.